You are here: Africa Media Online > Media > Media Management > MEMAT Features. You can store, manage metadata, organise, display and retrieve digital images, audio files, manuscripts and video or multimedia files. Archival quality media files can be ingested into the system at your offices or even uploaded from anywhere in the world, if that is needed, enabling you to manage your media collection efficiently from wherever you are. 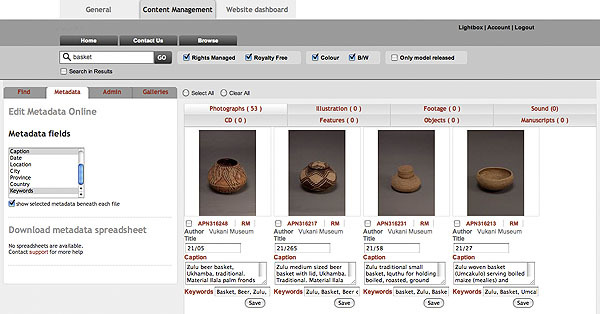 MEMAT’s presentation layer can be accessed by any web browser and includes password protected access, search and advanced search, a clean display of search results according to media type, the ability for users to make a selection of files and email previews of them to other decision makers, and the ability for a system owner or administrator to create galleries which showcase certain groups of media files within your collection. This means that those you approve can access your collection from anywhere in the world, to use it for research, to purchase use rights or even contribute to the collection, depending on what you want your users to do. MEMAT’s Asset Management Layer has support for all media types and common media file formats. Our emphasis is on open file formats that are extensively supported internationally, ensuring conformity to long-term preservation requirements. By using MEMAT for your media collection you can keep all your media types on a single system. Powerful search functionality returns results from millions of metadata entries in under a second and prioritizes them by metadata type. 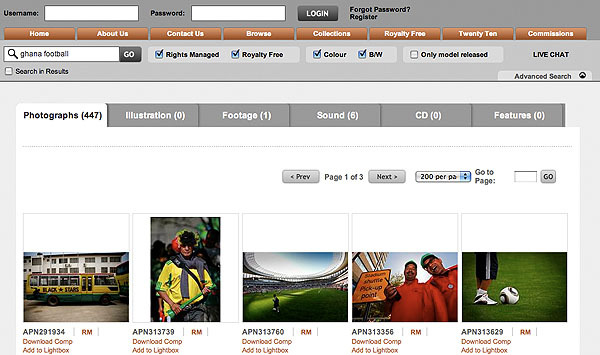 Above: Presentation of Photo search results for the search “Ghana Football” in the MEMAT Web Interface. By clicking on the tabs at the top of the screen one could navigate to results in other media types returned for the same search. Developed using Open Source technology – MySQL database with PHP, Perl and Ruby-on-Rails scripting languages – the system is non-proprietary. That means that there is always a community out there who knows how to work on it. In addition the open standards utilised by the system ensure interoperability with other systems, which means that your existing systems, including your website, can integrate with MEMAT. All of this is of vital importance for the long-term functioning of your digital archive. It means that the MEMAT system does not lock you into itself in any way but that at any stage your collection can be moved to any other system using open standards. Password protected access within MEMAT allows you to scale access to media files per user type. For example, System Administrator Access gives full access rights and the ability to administrate access. Browser Access, on the other hand, is the most limited access giving access to browse low-resolution versions and preview clips of media files. You have control over the level of access you want to give to users. There is also full tracking of file use. For instance as the system administrator you could give certain users access to download high-resolution files and you would be emailed a link every time a file is downloaded allowing you to keep track of who is downloading what files. Preview images are also protected by being watermarked. Based on a stock control system, MEMAT can keep track of millions of media files and multiple copies of the same media file. These measures mean that you retain control over all your files. MEMAT can be distributed to multiple servers anywhere in the world and still maintain solid control over media files on any number of those servers. Africa Media Online provides hosting solutions online “in the cloud” or can install servers in your organisation if an enterprise solution is required. With these options both larger and smaller organizations can find their best fit. Above: MEMAT enables you to work with internationally accepted metadata schemas ensuring that the work you do on your files on the MEMAT system is interoperable and exportable to other systems. With over a decade of experience in working with media files at global standards and recent participation in writing the best practices section of a National Digitisation Policy as well as advising many organisations in building a digital archive, Africa Media Online brings a wealth of experience in assisting organisations to produce media files at the right quality. Such standards are built into MEMAT and ensure long-term accessibility and usability of media files. 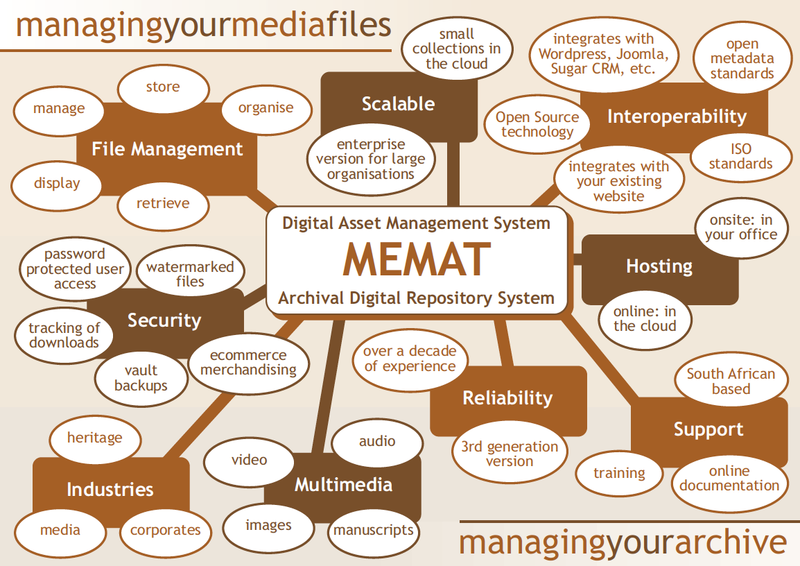 There is no limit to the number of media files that can be handled by MEMAT. The system is truly scalable and can be distributed across any number of servers anywhere in the world keeping track of every file. This means that MEMAT is a good solution whether your collection is vast or small. MEMAT was created by Africa Media Online in South Africa. However, we have proved that we are able to support organisations anywhere in the world. We are also able to provide in-house or remote training and comprehensive help videos are available online. 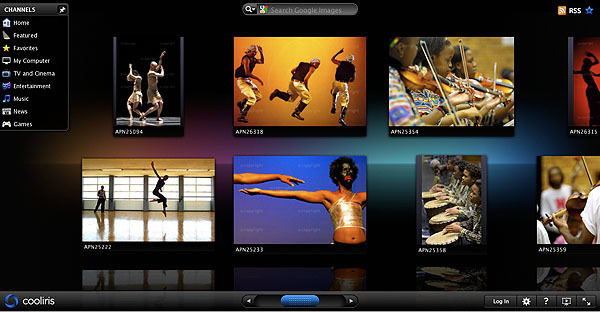 Galleries can be dynamically created to showcase certain groups of media files within your collection and these can be browsed or viewed as a slide show using the CoolIris plugin. Above: Viewing a gallery in CoolIris which also allows the gallery to be viewed as a slide show. Site users can create, edit and view lightboxes/wishlists and then email lightbox links and watermarked comps, as well as share, copy and move media files between lightboxes and lightbox users. 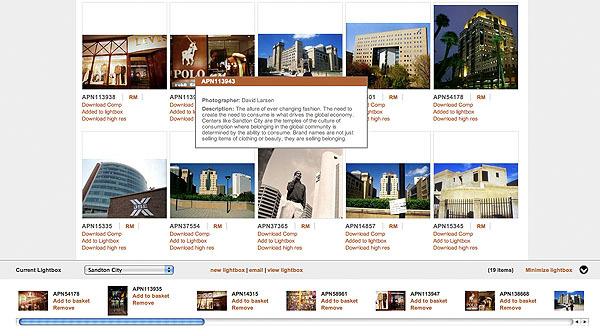 Above: The Lightbox functionality on a MEMAT site makes the compiling of media selections a pleasure. MEMAT is integrated with a professional Open Source Customer Relationship Management System (CRM), SugarCRM. This system captures all the details of those who sign up to your site and can be used to manage your entire contacts database. It can also be used to send out newsletters with embedded media. With the option of a full e-commerce purchasing pathway, the system can manage both “rights managed” use rights sales and “royalty free” sales as well as free use options where appropriate. Above: The first stage in the ecommerce purchasing pathway. A vital preservation service that MEMAT performs for you is not only the maintenance of your digital archive in the Digital Vault in Security Boxes in a Raid 5 array on the server, but also the back up of the entire archive to LTO tapes for off-site storage. This also ensure the migration of media files over time to new storage media. MEMAT forms part of the Digital Trade Route provided by Africa Media Online.